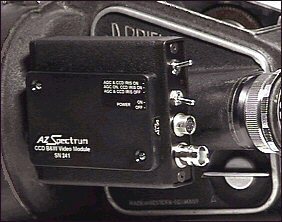 This video assist module is mounted to the camera door. It allows you to look through the viewfinder and display the picture from the video assist on a monitor at the same time. 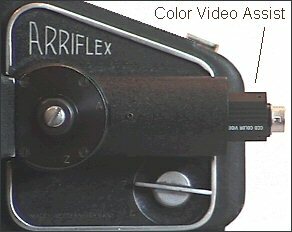 We also have a color video assist system which replaces the viewfinder section . This design has the best image quality and is ideal for steadicam operation. With this design, the viewfinder can be quickly reinstalled whenever the video assist is not needed. Select the white balance setting according to the lighting conditions. 3200K (fixed): for indoor shooting under incandescent light. 5600K (fixed): for outdoor shooting on sunny days. ATW (auto tracing white balance): the white balance is adjusted according to the color temperature transition of the subject. This mode is suitable for shooting with variable lighting. MAN (manual): Select this position when you want to adjust the red color with the R control and the blue color with the B control. 3 & 4 - SHUTTER speed switches. Set the SHUTTER speed switches to select the desired shutter speed. CCD IRIS: the video assist automatically adjusts the shutter speed according to amount of incident light, thus regulating the level of the video signal. 5 - AGC (auto gain control) ON/OFF switch. 6 - Y/C / VBS switch (to use this option you need a special cable). V/C: Select this position to output the Y/C separated signal. VBS: Select this position to output the VBS composite signal. R control for manual white balance adjustment. This control is effective when the WHITE BALANCE switches are set to MAN. Adjust the red color by turning the control. B control for manual white balance adjustment. This control is effective when the WHITE BALANCE switches are set to MAN. Adjust the blue color by turning the control.